The GT Hawk was a European style grand touring car made in South Bend, Indiana. 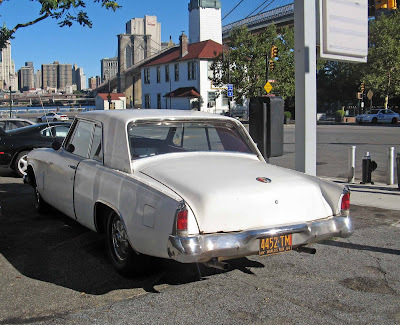 Designer Brooks Stevens borrowed extensively from other makers, most noticeably in the Mercedes Benz style grille and the Lincoln Continental inspired taillights. Nevertheless, the overall effect was handsome and well-integrated. 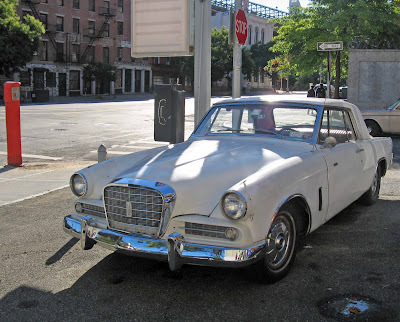 Studebaker even had some success selling it in European markets before shutting down production in 1964. This specimen is not in the best of shape, and is missing some chrome trim strips (to my mind, addition by subtraction). Still, it's eye-catching. Ending a dispute over the location of the ends of the Erie Canal, Gov. Eliot Spitzer [NY] said yesterday that Albany and Buffalo are the official eastern and western ends of the historic waterway. Supporters believe the designation will help develop the areas, particularly Buffalo's inner harbor. When the canal was built in 1825 it stretched 363 miles from Albany to Buffalo; an expansion in 1905, which allowed the passage of larger vessels, moved the navigable ends to the Hudson River in Waterford and the Niagara River in Tonawanda. Update: Twiffer sez: i bet this will help buffalo get, like, a pro football team or even a hockey team. (New dads get excused from having to hit the shift key.) I can't resist recounting my first hockey game, which was a Sabres-Bruins match in Buffalo in 1971. I got to see Bobby Orr set some record -- I think it may have been scoring in a single game by a defenseman. Meanwhile, August proposes a contest to name the Albany hockey team. He suggests the Pork; I counter with the Impasse. 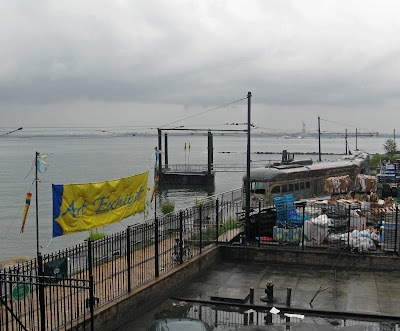 Red Hook revisited, and the Really Big Art Show. 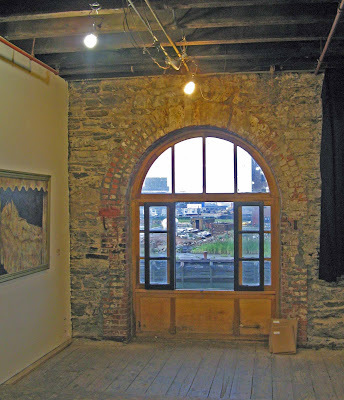 Yesterday my wife, our friend Barbara and I drove to Red Hook to help another friend, the artist Kei Andersen, remove and take home her two paintings that had been displayed at the Brooklyn Waterfront Artists' Coalition's annual Really Big Show, which is held in one of Red Hook's magnificent nineteenth century warehouses. 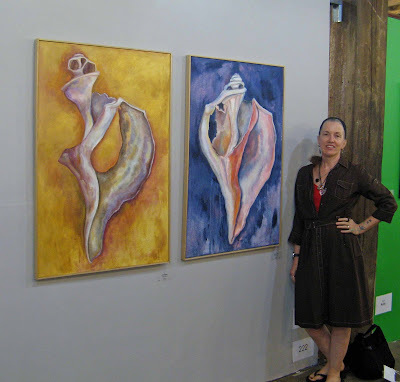 Below is a photo of Kei and her paintings, Broken Whelk I (left) and II. After looking over the show, and seeing among many things some fine displays of photography, I was drawn to the windows. From the westward side, I had a view of the trolleys that were the subject of this post, but from the opposite end, so that the trolley that once served the King of Norway is nearest. 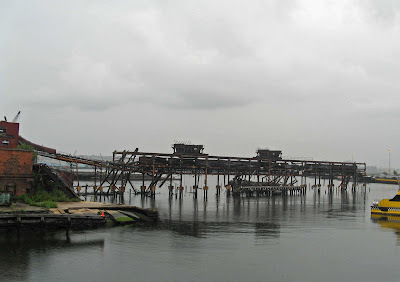 From the eastward side, I had a panoramic view of the ruins of a sugar refinery and the pier from which bulk sugar was once unloaded. The area east of the sugar refinery was once occupied by a shipyard, and is now the site of an Ikea store under construction. 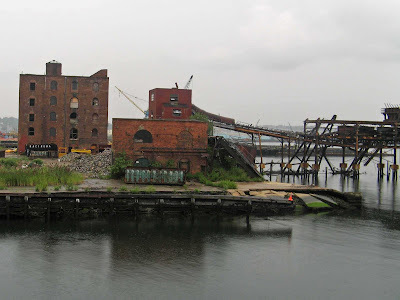 A graving dock that was built in the mid-nineteenth century, and in which work was done on many ships, including the Civil War ironclad Monitor, has been filled in for a parking lot. I have nothing against Ikea (love the meatballs!) and am glad we will no longer have to drive to New Jersey to shop there, but wish they could have found a way to preserve this bit of history. 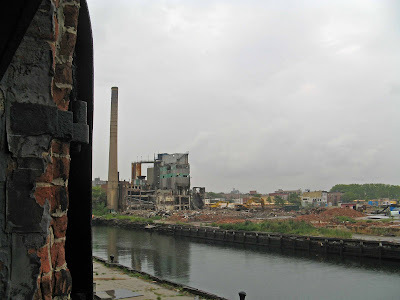 Addendum: On the subject of preservation of historic sites, Gowanus Lounge reports that several early nineteenth century buildings in downtown Brooklyn that played a part in the Underground Railroad are being taken by eminent domain for demolition to make way for (ironically) an underground parking garage. Read it and weep, here.